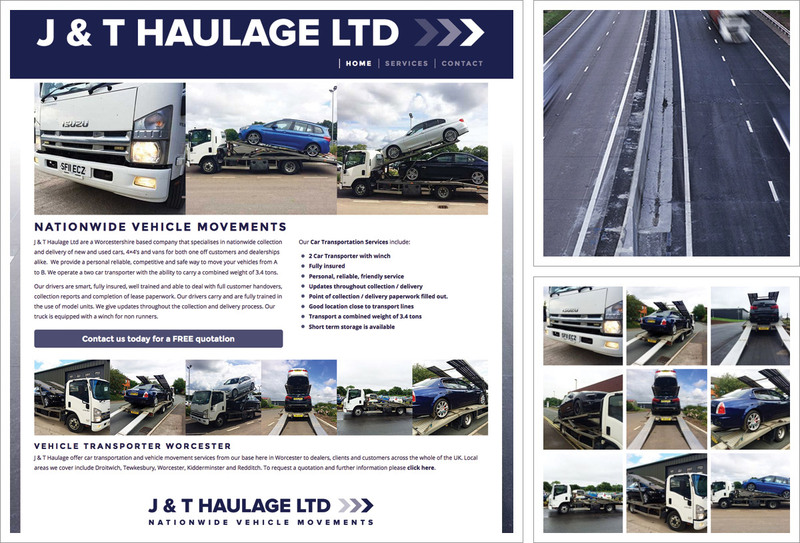 A new website for Worcester based J & T Haulage Ltd. J & T Haulage Ltd specialise in vehicle collection and delivery using their two vehicle car transporter. Although they are based in Worcester they provide a nationwide service. Logo development, domain name registration, hosting and mailbox set up and a new Google Local page was created. J & T Haulage Ltd needed a website and decided it was time to get their business online, raise the profile of their business and have a website to help them when tendering for new contracts. The website uses the newly developed J & T Haulage Ltd logo which was created and enhanced from a basic design in use on their documentation and invoices. A simple three page website detailing the services on offer and a secure online enquiry form.We completed some basic on-page search engine optimisation. The new website is responsive / mobile friendly which can be viewed and navigated on all types of devices. The website is completely expandable which means new content and pages can be added at anytime.